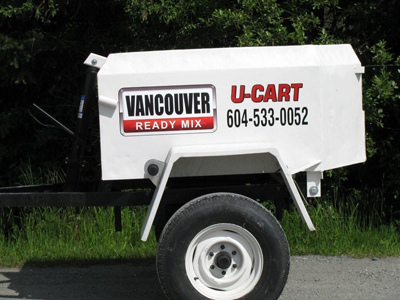 Vancouver Ready Mix provides you with a self service option with our U-Cart division. We can load a U-Cart with up to .8 cubic meters (approximately one cubic yard) of concrete, you tow it to your job, place the concrete, wash out the U-Cart and return it to our plant within 3 hours. Our concrete can be tailored for your specific requirements and combines the highest quality cement with aggregate, water, and if required special additives. Our specialty is small loads and customer service such as providing you with online tools to help you measure your project, flexible pickup, times, including overnight and concrete designed to meet the specifics of your project.